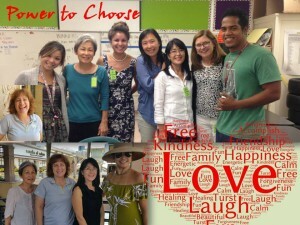 The Power to Choose is a unique Attitudinal Healing youth program for high school, middle school or elementary school students. Founded on the philosophy of Principles of Attitudinal Healing, the program supports participants to tap into their inner potential in order to become leaders who make healthy and positive choices in their everyday life. Participants will be equipped with an array of tools to enhance their decision making process, lift their self-esteem, cultivate their leadership abilities, and empower them to be agents of positive change. A versatile curriculum, The Power to Choose is adaptable for in-school, after-school, multicultural and community-based programming with flexible time frames that adapt to the needs of group members and facilitators. The curriculum integrates Attitudinal Healing, character development and leadership training into one unique model that builds healthy and safe communities where members can thrive and feel empowered by the decisions they make. Empowered individuals have a greater understanding of their day-to-day experiences, which allows them to make healthier and more positive choices every day. In the Power to Choose participants connect with their inner potential and innate intelligence in order to experience love, peace, and happiness over stress, anxiety, fear or any other feeling that creates an obstacle to a satisfying life. Letting go of fear is healing. As we heal our own fears, we help to heal each other, and together we heal the world.